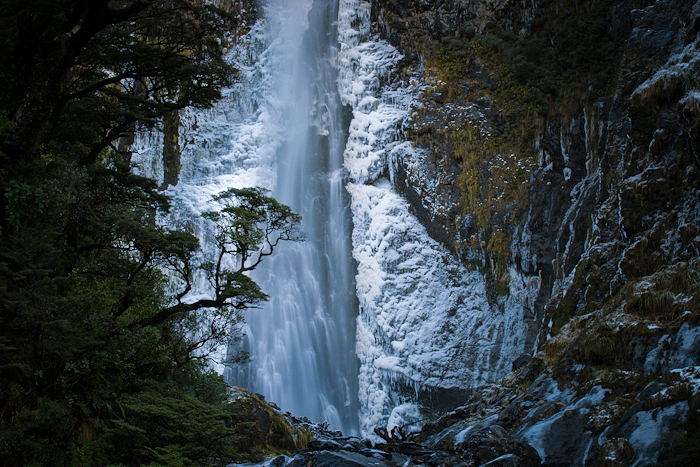 On my way… and a recent trip to Arthurs Pass in the South Island of New Zealand reveals a scenic gem. A short but vigorous walk about 30 minutes from the township will lead you along a well maintained track to an observation platform. The scene before you is breathtaking and especially so during the winter months, when snow and ice create a beautiful contrast with green native plants against the orange and brown surrounding rock face. There is a feeling of being enveloped in a giant picturesque cave along with the constant background music of falling water.